We discovered in our freezer-of-endless-wonders some reserved ground beef that we’d set aside to make a Bolognese meat sauce and thus couldn’t resist the opportunity to try it out. Mined from Marcella Hazan’s Classic Italian Cook Book, it seemed to be a straightforward if not slow-cooking (3.5-4 hours) recipe. In a large, deep pot (preferably an earthenware one) put in chopped onion, with the oil and butter, and sauté briefly over medium heat until just translucent. Add celery and carrot and cook gently for 2 minutes. Add ground beef, crumbling it into the pot with a fork. Add 1 tsp salt, stir, and cook until the meat has lost its raw, red colour. Add wine, turn the heat up to medium high, and cook, stirring occasionally until all the wine has evaporated. Turn the heat down to medium, add milk and nutmeg, and cook until milk has evaporated. Stir frequently. When milk has evaporated, add tomatoes and stir thoroughly. When the tomatoes have started to bubble, turn the heat down until the sauce cooks at the laziest simmer, just an occasional bubble. Cook, uncovered, for a minimum of 3.5 to 4 hours, stirring occasionally. Taste and adjust seasoning. A few notes on preparation: Towards the end of cooking, David stirred in a 1-1/2 tbsp of butter to add a bit of smoothness. In the end, the sauce was heated at perhaps more than a lazy simmer, with more than the occasional bubble, so it was done in about 3 hours. 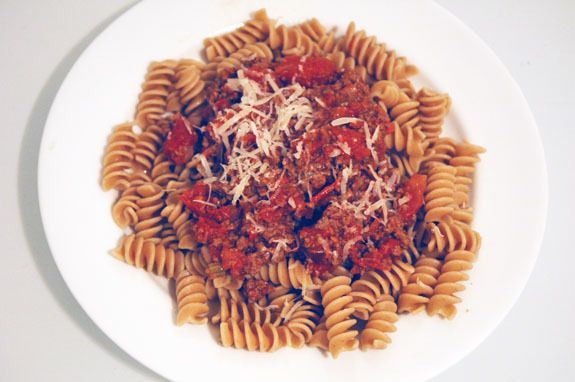 We served the meat sauce over some whole wheat rotini with a bit of Parmesan cheese sprinkled on top. The meat sauce was very tasty–rich, though still but a tart from the tomatoes. It tasted even better the next day, as it had time to thicken up and the flavours had time to develop. Makes for a hearty lunch indeed.